Emerging out of the 1960s Civil Rights Movement and in response to racial apartheid in the United States, Ethnic Studies as a field has been contested throughout history. Experiencing political exclusion, economic exploitation, and deculturalization in schools, Black, Chicana/o, and Filipina/o activists formed the Third World Liberation Front in 1968, which became the grassroots vehicle in the struggle to institutionalize Ethnic Studies courses at the high school and college levels throughout California. This renewed struggle has been taken up more recently, in response to the dismantling of the Mexican-American Studies (MAS) Program at the high school level in the Tucson Unified School District. In California growing movements have arisen to make Ethnic Studies a graduation requirement in several major school districts. These state-wide efforts are historic on many levels and offer opportunities for making education relevant to students’ lives and thereby addressing educational problems such as student attrition/push-out rates and student dis-engagement. UCLA Center X and the California Chapter of the National Association for Multicultural Education (CA-NAME) have partnered to highlight the work of these statewide efforts. While teacher preparation, support and development are goals of our two organizations, both came together to support the Ethnic Studies movement via the creation of a repository of resources about the teaching of Ethnic Studies in K-12 schools in California. This edition of the XChange brings together the voices of teachers, researchers, teacher educators, pre-service teachers and community activists integral to the emergent Ethnic Studies movement in California. Our goal was inclusivity. Nonetheless, we know that we were not able to engage all the communities, schools, and organizations in California supporting the teaching of Ethnic Studies. Thus we imagine the XChange as a living body of work which we hope expands as Ethnic Studies in K-12 settings and teacher preparation evolves. We invite your voices and perspectives. In “Political and Historical Context” scholars and educators provide a collective lens on the institutional and historical contexts that make Ethnic Studies possible. The video and audio interviews are organized by the following themes: Foundations of Ethnic Studies, Biography, Teacher Education and Teacher Development, and Ethnic Studies in Five Years. In “Praxis” practitioners share glimpses into Ethnic Studies practices in K-12 classrooms highlighting their situated context as well as cautioning us against hasty implementation and quick fixes. In “Innovations” we spotlight the work in progress of researchers, districts, and teacher preparation programs to prepare and support the teaching of Ethnic Studies in K-12 classrooms. 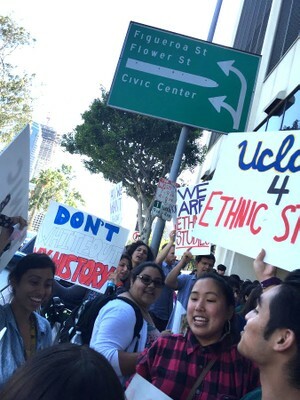 In “Reflections on Becoming an Ethnic Studies Educator” students in the UCLA Teacher Education Program Ethnic Studies Pilot reflect on their first year of learning. Our last section, “Research,” lists previously published scholarly articles as well as original research articles focused on the teaching of Ethnic Studies in K-12 schools. Ethnic Studies is fundamentally about liberation. It is in the spirit of hope and possibilities that we present this Ethnic Studies themed edition of the XChange. Emma Hipolito is the Director of the UCLA History-Geography Project, a site of the California History-Social Science Project, housed in Center X. She specializes in supporting in-service and pre-service social studies teachers with a focus on instruction and curriculum, professional development and literacy. Miguel Zavala is Associate Professor in the College of Educational Studies (CES) at Chapman University. His research explores the possibilities of learning and teaching within grassroots and other alternative spaces working with and alongside teachers and youth. In particular, he builds on the emerging scholarship by critical Chicana/o and Indigenous scholar-activists, using a decolonial framework for understanding the dialectic of identity, critical consciousness, and civic engagement. He is co-Chair of the California Chapter of the National Association for Multicultural Education.